The word “cancer” is a devastating thing to hear your doctor say. It changes your whole life — in that moment, you feel that your life could be coming to an end, and that’s very scary and depressing to think about. You feel alone, like no one can possibly understand what you are going through and that no one can make this situation better. But I was fortunate to find someone who did understand. More than three years ago, in the summer of 2014, I met an amazing nurse named Jenni Chang, who was assigned as my primary nurse. I was admitted for chemotherapy treatment for sinonasal cancer, and from there, the story of our friendship begins. As a United States veteran — I served as a sergeant in the Marine Corps for three years, from 1974 to 1977 — I had dedicated my life to serving others and protecting their freedom. On that day, I met someone special, my angel, to take care of me. I have never seen someone so dedicated to caring for a specific patient population, veterans, whom she treats as if they are her own family members. She shared her touching story with me: A few weeks after her “sweet 16” birthday, she received a diagnosis of leukemia. She told me that her 28 months of chemotherapy treatment led her to become the oncology nurse she always wanted to be, with the goal of dedicating her life to giving back to patients and their families. She vowed to give them the sense of hope that I and others needed and strive to have when life throws an unexpected curveball that threatens everything you hold dear. She shared with me not only her experiences with chemotherapy and treatment but also how she felt and how she overcame adversity at such a difficult time in her life. She talked to me about how she received some of the same chemotherapy medications I received and how she had a Mediport, just like me. It is so rare to find someone so like you, a person diagnosed with cancer who can say, straight up, “I’ve been in your shoes” — who has walked the same path, experienced the same struggles and trials of going through a cancer diagnosis, chemotherapy treatments and years of fighting for your life. Her personal experience and firsthand knowledge of what we go through shows me the kind of person she is. She is so focused and driven, using her experience of the worst time in her life as a story and inspiration for others. I see now that those worst moments and years shaped, groomed and molded a path for her to become a strong, courageous, intelligent and exceptional oncology nurse. 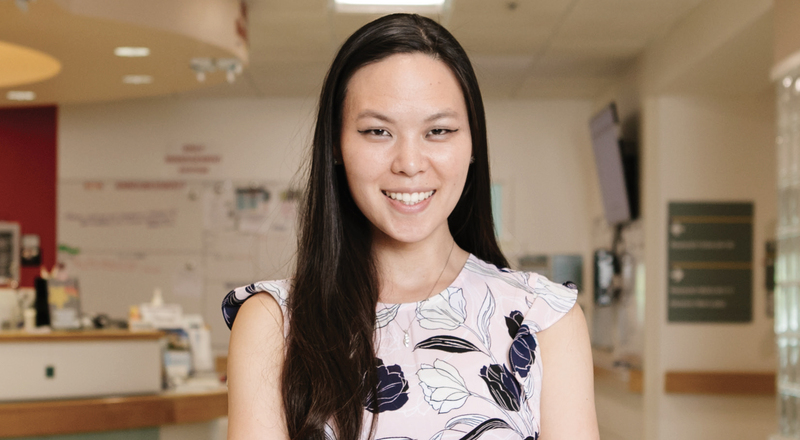 She demonstrates a passion for this field and the patients and families she cares for. She shows not only great empathy but also great heart and is a real inspiration to me, my family and all the patients and families she encounters. I know she has my back and that whenever I call regarding a follow-up appointment, medications or side effects — or just to talk about the things I’m going through and how tough it is sometimes to keep on fighting — she is always there to listen. She is always present and attentive and never gives up on me. If I’m ever at the veterans hospital for a follow-up appointment, treatment or an unexpected emergency room visit, I always want her to hear about it directly from me and ultimately to know I’m OK, because I know she cares so much about me. Even when she wasn’t my assigned nurse, she would make and take the time to talk about my day, share experiences and be with me. I also know I am not the only one who appreciates this, as many other oncology patients fight and make requests for her to be their nurse. I’m fortunate to have known her for so many years that I get first pick. But even then, as she cares for me, I see her making time to see the other oncology patients and their families on the floor, too. I honestly have not met anyone like Jenni before. She goes way above and beyond for me, my family, our veterans and their families, and, honestly, I don’t think I would have lasted this long without her. Her passion, dedication, compassion, honesty, love and humble personality make me so blessed to have met such an amazing soul in the worst time of my life. I know that God brought her into my life, and I know she was meant to be a part of my cancer journey. I am continuing to fight my cancer, as I’ve had some setbacks from time to time, but that smile every time I see her is what brings me to life. I know that if anyone can help a patient fight, beat, conquer, overcome and survive cancer, it’s Jenni Chang. For that patient and their family, I would say that they hit the lottery and have their own personal angel watching over them.